They departed last week from NYC, along with their son Darshen and 6 young, adventurous crew members, for a six-month voyage through the jungles of Guyana, South America and the Caribbean. Their mission is an admirable one: to raise awareness about the sustainable uses of water through their partnership with the World Water Rescue Foundation. “Not only is this a chance to experience a life changing adventure, but I also see this as an opportunity to grow personally and artistically.” said crew member Carly Tyrens, 24. You may have heard of Reid Stowe and Soanya Ahmad. This isn’t their first tango with the open seas. 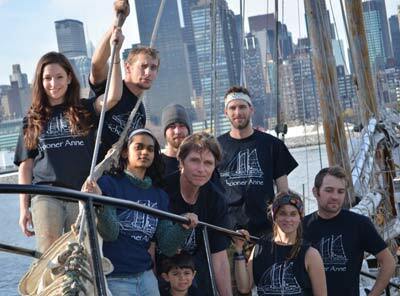 Stowe made headlines around the world in 2010 when he returned to NYC after spending 1,152 days at sea. This is the longest continuous voyage of any kind undertaken by a human being…ever! I’m already losing my voice talking here today and I haven’t talked to people in 2 years…No one understands what I went though physically and mentally. My words may sound bold but nothing can match the majesty of the sea. They plan to remain at sea on their newest endeavor until May 2012. You can meet the crew, learn more about their project and read about their adventures on their website. We love learning about these daring boating adventures! We wish the crew aboard “Anne” fair winds and following seas as they travel to the depths of the South American jungle. We will update you as their trip progresses.